A Midnight Feast Tea Party with "The Vintage Tea Party Book"
The Secluded Midnight Feast was hosted at my very own Tea Party mansion in sunny Cambourne in Cambridgeshire, an Afternoon Tea with a unique difference… It was held in the evening, as (believe it or not!) a midnight feast tea party. With the permission of the fabulous Angel Adoree of The Vintage Patisserie in London, she allowed me to bake some of her stunning recipes from her new book, simply titled “The Vintage Tea Party Book”. In no way was I asked to do this, quite the opposite. I fell in love with this book just from a glimpse of the front cover and I contacted Angel right away to ask if it was ok to cook her recipes for this particular event. She was even kinder than I had expected and was very kind to have agreed to this, so I can’t thank her enough for letting me do this. Her book is so beautiful, I have it pride of place on my very own coffee table for everybody who visits my home to see, and I desperately wanted to blog about her lovely recipes as they are just divine, even to just drool over whilst reading this hardback book. Not only does it host some very simple, yet enticing recipe suggestions, it also offers advice on setting your tea party table, what to wear, how to do your hair and makeup, even a section for men on how to dress and groom before sitting down to tea. This book should be owned by any tea party or cake fanatic, and it would make a perfect gift for Christmas – if you can bare to give it away! My venue was The Secluded Tea Party HQ (My very own Kitchen) for a proper Underground Restaurant feel to proceedings for once in my tea party life… This is where the idea stems from, however as my home is quite small in space, I tend to pop up in different locations rather than host it at my humble abode, and this does work very well. However, it was lovely to be able to host a smaller event offering warm food fresh from the oven – Bliss! 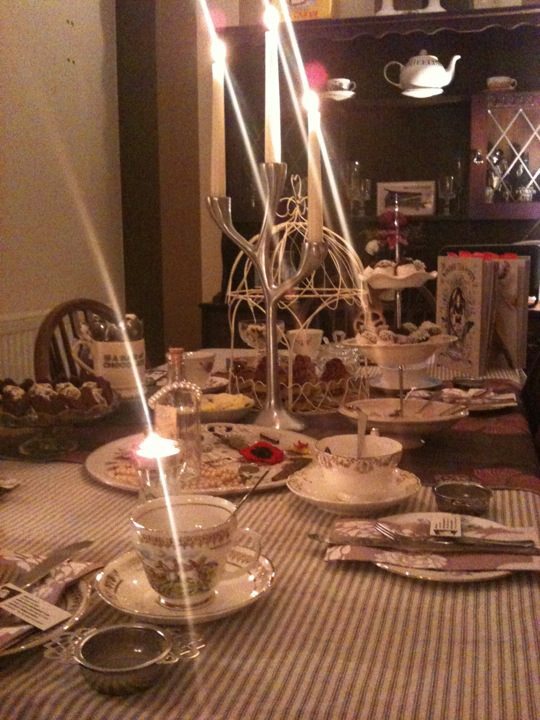 I set my small and intimate table for 6 guests for this tea party event, set with candles and chocolate and even some tempting chocolate-dipped marshmallows and chocolate & marshmallow melting spoons for a naughty midnight feast treat to use in our naughty hot chocolate towards midnight. As well as a lovely returning gentleman guest, some of my guests had travelled from as far as Kent and South East London, much to my excitement, such an honour to have my tea party attendees travelling to Cambridge and enjoying a day of punting followed by afternoon tea. I also took some more inspiration from “The Vintage Tea Party Book” and offered a table setting in the form of a fun parlour game, something of which Angel again is very passionate about offering alongside her events bringing back the simplicity of tea party entertainment. I set up an antique tea tray with some beautiful pearls, old perfume bottles and other such nicnacs to play a game where guests could close their eyes and somebody would remove an item and the others would have to guess what disappeared in a memory game. However, conversation freely flowed and did not stop until 1am, and so we did not get to play this game hehe. But it looked great on the table for my guests to nosey at whilst we nattered over the tea party treats I had made. The tea of course was flowing, my Rhubarb & Custard variation being requested several times as well as a new addition of a Rose tea for everybody to sip on. Whilst my afternoon tea menu consisted of Angels’ delicious Goats Cheese & Leek Welsh Rarebit with Chive Grass (hot from the oven as a starter) followed by fluffy Brie & Walnut Scones and a herb butter to melt onto these gorgeous savouries. We then enjoyed chilled Orange Possets topped with the most amazing tasting spiced walnuts, of which I plan to make again this weekend for a family meal. They were served in mismatching tea cups and were a perfect deviation from my usual cake-only menus. This recipe is worth buying the book alone. It’s so easy, yet moreish, this is going back on the menu again one day soon! We ended the evening with Miss Adoree’s engraved Earl Grey Truffle Hearts and my own additions of Oreo Truffles drizzled in white chocolate as well as miniature Chocolate and Cherry layer cakes with a cherry buttercream filling.